When you aren’t a certified water damage cleanup specialist detecting water damage isn’t an easy task, especially when the water damage loss isn’t evident right away. In fact, most water damage incidents start out small and go undetected for prolonged amounts of time before they are found, cleaned up and restored. By the time these small incidents are found the underlying problem causing the water damage can become disastrous and difficult to manage on your own. 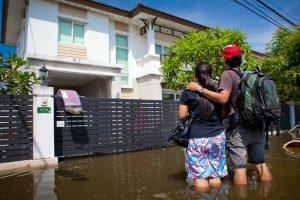 In order to avoid these devastating conditions, as a homeowner, you might want to get acquainted with the initial warning signs of water damage in your home. At Sierra Restoration in Logan, our certified water damage experts love to help local residents recover from any water damage loss, however, we love helping those residents discover early warning signs even more. That is why we compiled a list of warning signs. Water damage can be detected by more than just your eyesight. Signs of water damage can also be heard and smelled (more on that in the next section). If you hear the soft, possibly annoying sound of dripping water or running water, your home may already be affected by a water leak. We know these sounds can also occur, even if there are no leaks and your plumbing system is in working order, but you still want to check your home for water leaks when you hear these sounds consistently. We bet you knew this was coming. When areas in your home become wet or have excess moisture a distinct odor will start to waft through the air. Dampness produces a pungent smell, most commonly associated with mold. Speaking of mold, it loves damp spaces and can be found growing in areas of your home that have been affected by water damage. It is common to find mold growth in poorly insulated areas of the home, such as a bathroom with now venting systems, a basement with high humidity, or a crawlspace with poor insulation. When you discover mold do-it-yourself attempts may help in removing the mold temporarily, but it takes a professional to completely remove the mold from your home and find the source of that mold growth. If you don’t find the source, removing the mold won’t do you any good. It is just going to come back as the excess moisture continues to pour in. Discoloration of your ceiling and walls can also be signs of water damage. Do you have round brown or darker spots on your ceiling? Do you see streaks of darker color running down your walls? Chances are there has been water flowing under the surface at some point. And it can still be running if the source is still active. Note, that discoloration in your home can occur for multiple reasons so it’s important to make sure the discoloration is actually the result of a water damage event. For example, if your household allows smoking there may be discoloration on the ceiling and walls. If you find any sign of water damage in your home, contact a trusted water damage remediation company like Sierra Restoration to help you with all of your water damage needs.